The NC DOT tasked us with delivering new branding and a new ad campaign that spoke to prospective riders, both millennials and retirees. “Go. 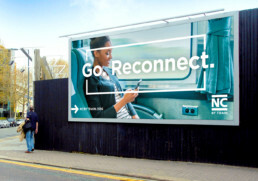 Reconnect.” speaks not to the hurried business traveler, but to the person who may be visiting family and friends, or to the carefree passenger who simply wants to take in the state as they make their way to their destination. After launching our Go. 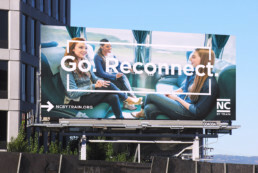 Reconnect campaign, ridership went up 4% in its first month, increasing to double-digits the second month. The assignment began with the creation of a new logo. Using cues from rail and travel iconography, we crafted an easy to recognize mark, and a design system that always points the viewer in the right direction.